I first heard of Viseart palettes around 2 years ago but they weren't available to buy in Ireland but also because they are so expensive, I put them out of my head. Fast forward to May this year and I was in Sephora in Orlando and I think that the combination of my excitement at being in a Sephora for the first time coupled with just being in holiday mode, made me buy the Viseart Neutral Matte Palette without too much hesitation. Well I did hesitate a little because of the $80 price tag but I was at the "in for a penny, in for a pound" stage and my basket was rapidly filling up so I just thought "why not?!" Today I am going share my thoughts on this palette with you & whether or not I think it is worth the price. First of all I have to say that this is the most expensive eyeshadow palette that I own and I never really thought that I would pay so much for one. At home, I don't know that I could actually hand over that much cash for some eyeshadow but there is something about being on holiday that makes me feel a little spendy! 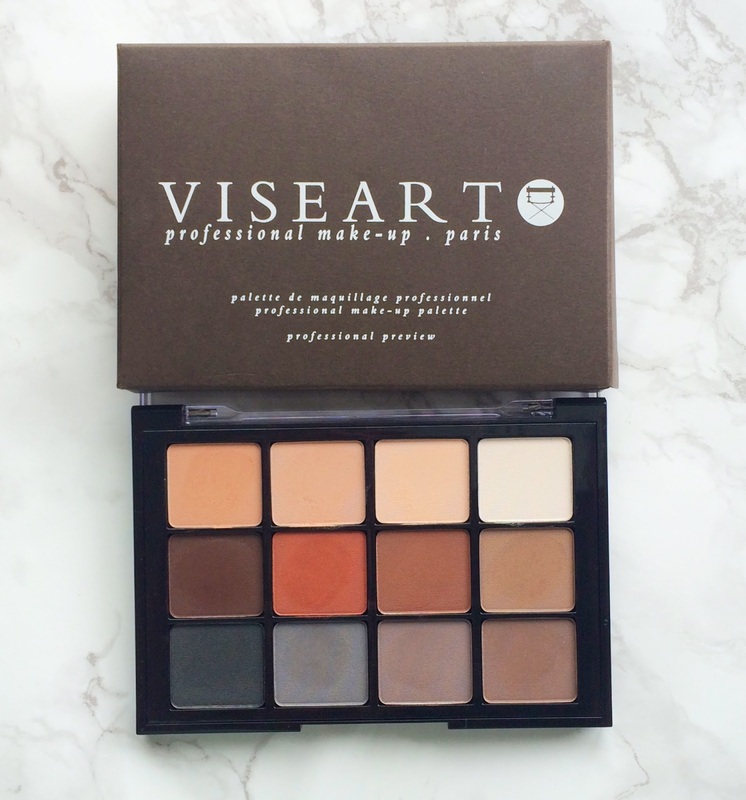 Viseart is a Parisian brand and their make-up is described as being for professionals. The eyeshadow palettes come in three finishes: matte, satin and shimmer. They also have lip palettes, a brow palette and a contour, correct & camouflage palette. I chose the Neutral Matte palette as I already have plenty of satin & shimmer shadows (to be fair I also have a lot of matte shadows, but fewer of those than satins & shimmers) and the neutral palette appealed to me the most. The packaging of the palette isn't anything fancy but it is practical with a see-through lid and the plastic seems to be pretty sturdy. I love that there is no gimmicky brush and 12 pretty good-sized shadows with 24g of product in total. Although this is the neutral palette, I would describe a lot of the shadows as being pretty warm in tone. Most of the shadows are extremely pigmented, however the two palest in the top row are less so than the rest. Although the shadows are matte, they aren't chalky in texture yet they do kick up some powder in the pan but once I tap my brush, the loose powder doesn't transfer to my eye & doesn't cause any fallout on the face. I wouldn't describe the shadows as being buttery soft but once applied to the lid, they blend so beautifully and easily. The wear time on these shadows is probably the best I have ever had with any shadows I have ever used ( and I have tried A LOT of eyeshadow brands because eyeshadows are my thing). I have tried them with and without eye primer and although a primer makes a difference (I have extremely oily eyelids), even without a primer, they lasted so much longer than other shadows without creasing or fading. Some of the shadows are very similar in colour to those in the Kat Von D Shade & Light Eye Contour Palette, which at $48, is almost half the price of the Viseart palette so if you already own that, you don't need this but I would recommend trying a different Viseart palette because I think that you really couldn't find a better eyeshadow formula. If you are outside of the U.S. then you will be happy to hear that BeautyBay now stock Viseart, although this particular palette is currently out of stock. So do I think it is worth $80? It is difficult to say - yes, the formula is pretty much second to none but can any eyeshadow ever be worth $80? Saying that, Tom Ford quads are pretty similar in price but only contain 4 shadows, at least with this, you have 12 shadows! If you like to stick to mattes and are not a palette fanatic, then this product is for you because you can create a variety of looks with it. However, if you like a variety of finishes and some colour then you probably don't want to spend so much on just one palette when you could buy two or three for that price. In this case, maybe you'd like to try one of their new 6 pan palettes, which are pretty much half the price of this palette. I haven't tried any of them so cannot say that they are the same formula but I would hope that the brand would be consistent. I would love to hear your thoughts on this palette? What is the most expensive palette in your collection? Do you spend more freely when you are in holiday mode? Please tell me in the comments below! This product was bought with my own money.